Established in 1903, the South African Journal of Science is the leading multidisciplinary research journal in Africa, and features a great diversity of original work by researchers throughout the country and abroad, concentrating on articles that have an appeal that is wider than that of single disciplines. Quest: Science for South Africa is a full-colour, quarterly, popular science magazine directed at a target audience comprising learners, educators and the general public. The Scholarly Publishing Unit takes responsibility for ensuring that Open Access initiatives are promoted to enhance the visibility of all South African research articles and to make them accessible to the entire international research community. Access the previous newsletters for "Science for Society" by clicking on the buttons provided under this section. There is also an option to subscribe to the newsletter as well as regular updates on ASSAf. Best Practice Guides have been produced to improve the quality of editorship of South African scholarly journals. ASSAf regularly issues statements and joint statements together with other academies or science academy networks, on key issues of common interest. ASSAf provides commentaries on topical and relevant government policy documents and White Papers. ASSAf selectively publishes proceedings reports of events held by the Academy, as well as assessment and other reports. ASSAf's reports are available to download in pdf format. 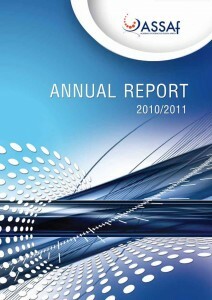 ASSAf's Annual Reports are distributed to stakeholders and Members. Each report gives an overview of the activities of ASSAf over the year under review and includes the annual financial statements. The ASSAf Act provides the framework for identifying the Academy’s overarching goals, within which the strategic priorities and focus for the next 5-year period are outlined. The mandate of the Academy encompasses all fields of scientific enquiry and it includes the full diversity of South Africa’s distinguished scientists. The Parliament of South Africa passed the Academy of Science of South Africa Act (Act 67 of 2001), as amended, which came into operation in May 2002. In celebration of this mandate, ASSAf has published a number of books. Legends of South African Science introduces Academy Members who rank among the top achievers in the country. Legends profiles ASSAf Members who have received some of South Africa’s top awards, viz. the ASSAf Science-for-Society Gold Medal, National Orders of Mapungubwe and Baobab bestowed by the President, or the Harry Oppenheimer Fellowship. Among the 54 Members featured in the book are a biologist and Nobel Laureate who helped decode DNA; an epidemiologist recognised for groundbreaking research on HIV prevention in women; a social scientist who nudged and cajoled into place the campaign to understand and contain HIV/AIDS in South Africa; a leading mathematics education proponent; a human geneticist whose work helped to clarify the origins of indigenous groups in Africa; one of the world's leading theorists in cosmology; and a leading immunologist and physician who pioneered higher education transformation in South Africa, in sometimes controversial ways. In Pursuit of Excellence recounts the 20 years of ASSAf’s existence since the early 1990s when trailblazers in academia gave of their time and energy to realise a dream of establishing a fully representative, national academy of science to guide the democratic South Africa into a promising new era.